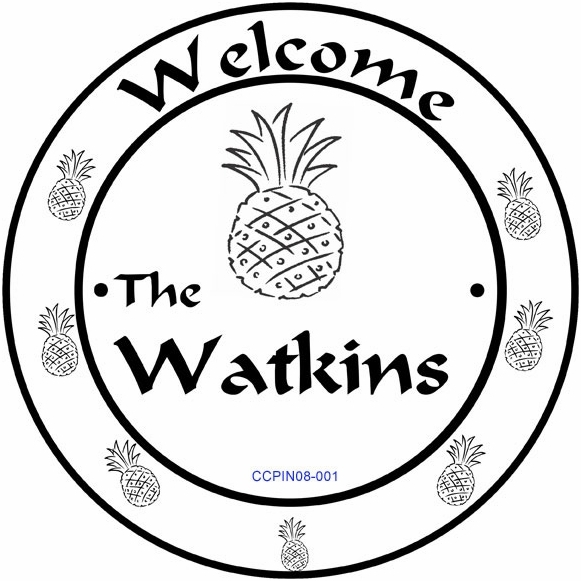 Personalized Welcome Sign with Pineapple Border - - custom made 8" round Welcome plaque. Made in USA. Engraved pineapple logo and your name fill the center. Multiple smaller pineapples around the perimeter reinforce the Welcome statement at the top and accentuate the circular shape. Custom made with your choice of color and name you specify. One line of personalization with up to eight (8) 1" characters. The words "Welcome" and "The" are standard. Note: the style number near the bottom of the sample sign is for internal use only and is not shown on your custom sign. Made from sturdy and UV-stabilized laminated acrylic. All wording, pineapple images, and thin border are permanently engraved into the sign during the production process. The pineapple has been a symbol of health and greeting for hundreds of years and is frequently found on address or home signs.